Caught in the iron grip of the galaxy’s most powerful gravitational field, a star known as S2 passed within a scant 20 billion kilometres (12.4 billion miles) of the supermassive black hole lurking at the heart of the Milky Way this past May, streaking by at an astonishing 3 percent the speed of light, or more than 25 million kilometres per hour (15 million mph). Infrared light from the star made its way through intervening clouds of dust across 26,000 light years to Earth where astronomers have been monitoring S2 and other stars near the black hole for the past 26 years. Using a suite of sophisticated instruments attached to the European Southern Observatory’s Very Large Telescope, an international team of researchers found the star’s motion did not agree with predictions based on Newtonian, or classical, physics. But the numbers were in close agreement with predictions made using Einstein’s theory of general relativity, revealing a phenomenon known as gravitational redshift in which light from S2 is stretched to longer wavelengths in the gravitational field of the black hole. 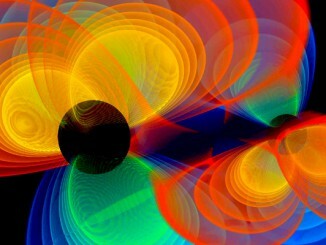 The change in wavelength agreed precisely with general relativity, the first time such a deviation from the predictions of classical physics has been observed in the motion of a star near a supermassive black hole. 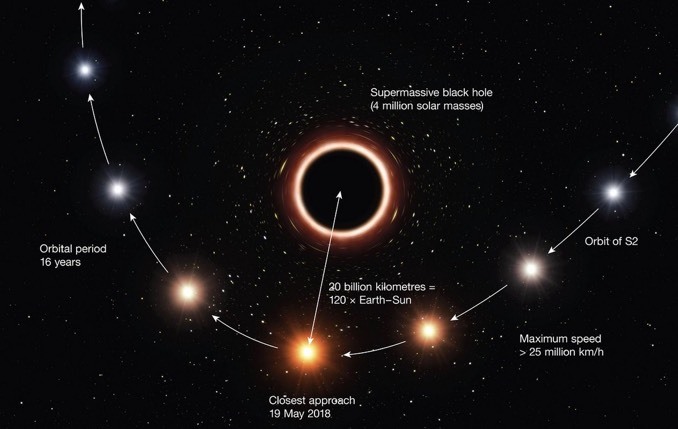 “This is the second time that we have observed the close passage of S2 around the black hole in our galactic centre,” said Reinhard Genzel of the Max Planck Institute for Extraterrestrial Physics (MPE) in Garching, Germany. The trail-blazing observations were made using the Very Large Telescope and the GRAVITY, SINFONI and NACO adaptive optics instrumentation. GRAVITY combines beams from all four 8-metre VLT telescopes to measure astrometric distances with unprecedented precision while SINFONI is a near-infrared spectrograph. The SINFONI spectrograph measured S2’s velocity toward and away from Earth while the VLT Interferometer and GRAVITY made precise measurements of the star’s changing position to determine the shape of its orbit around the black hole. “Our first observations of S2 with GRAVITY, about two years ago, already showed that we would have the ideal black hole laboratory,” said Frank Eisenhauer, principal investigator of GRAVITY and the SINFONI spectrograph. 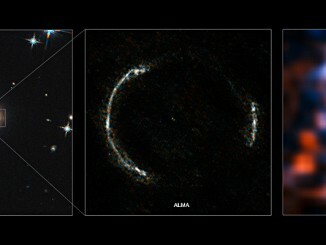 The observations were carried out by an international team led by Genzel with collaborators at the Paris Observatory–PSL, the Université Grenoble Alpes, CNRS, the Max Planck Institute for Astronomy, the University of Cologne, the Portuguese CENTRA – Centro de Astroﬁsica e Gravitação and the European Southern Observatory. 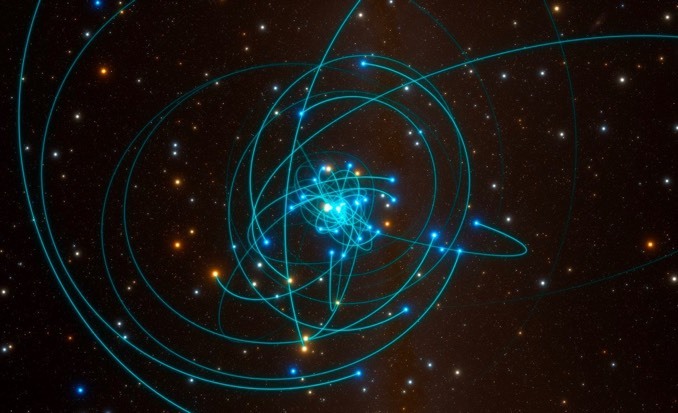 Ongoing observations of S2 may confirm yet another prediction from relativity theory – slight changes in the star’s orbit known as Schwarzschild precession – as the star moves outward from the black hole. The Atacama Large Millimetre/submillimetre Array has produced a spectacularly detailed image of a distant galaxy known as SDP.81 that is being gravitationally lensed. The image shows a magnified view of the galaxy’s star-forming regions, the likes of which have never been seen before at this level of detail in a galaxy so remote. 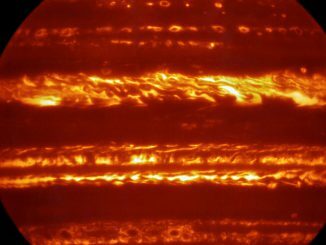 In preparation for the imminent arrival of NASA’s Juno spacecraft, astronomers have used ESO’s Very Large Telescope to obtain spectacular new infrared images of Jupiter as part of a campaign to create high-resolution maps of the giant planet. These observations will help astronomers to better understand the gas giant ahead of Juno’s close encounter next month. One hundred years since Einstein proposed gravitational waves as part of his general theory of relativity, an 11-year search performed with CSIRO’s Parkes telescope has shown that an expected background of waves is missing, casting doubt on our understanding of galaxies and black holes.